While the roasted turkey may be the star of the American Thanksgiving table next Thursday, turkey feathers have had a steady supporting role in the fashion world for centuries. Last spring, Karl Lagerfeld introduced his Autumn/Winter 2013 Ready-to-Wear collection for Chanel, which featured an abundance of ornamental turkey pointers and flats, bringing a fresh, modern use to a material that has long been used in fashion. 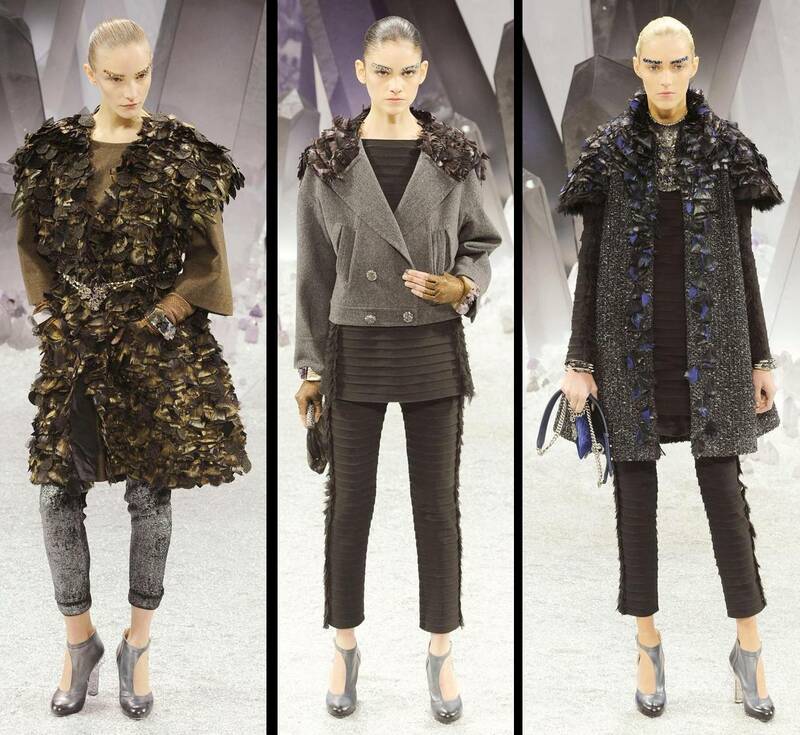 Karl Lagerfeld for Chanel, Autumn/Winter 2013 Ready to Wear Collection. Feathers of all kinds have enjoyed a ubiquitous presence in fashion across many cultures and centuries; turkey feathers in particular are often used because of their abundance and ease of dyeing. They come in different sizes and shapes and are well-suited for a variety of purposes: flats come from the turkey’s back, pointers from the wings, and marabou, which is often used for making boas, is found at the turkey’s hip. 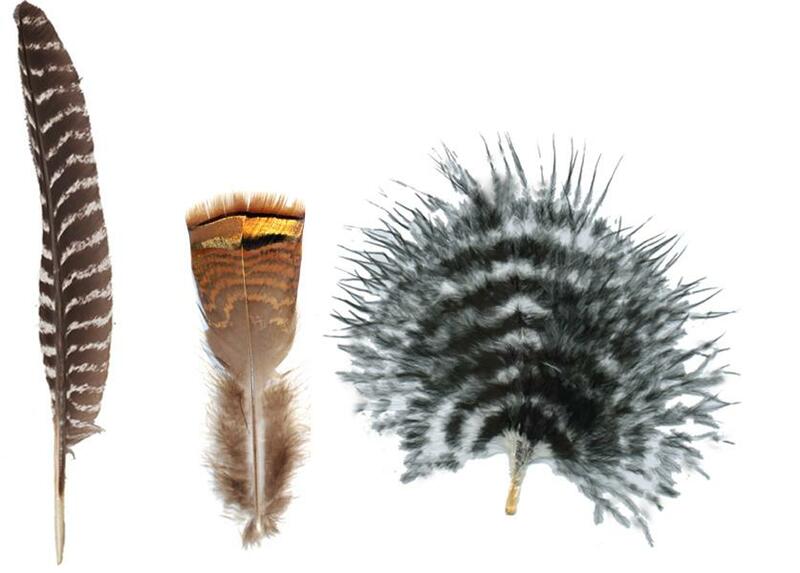 Different types of turkey feathers. From left: pointer, flat, marabou. 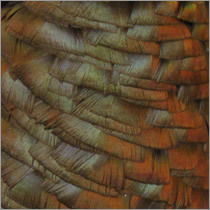 The colors naturally found on turkey feathers can be quite beautiful. Wild turkey feathers. Credit: USFWS. In the nineteenth century, turkey feather fans rose in popularity. They were often made at home, especially when the blockades during the Civil War prevented fine European fans from being imported. Turkey feather fan, mid-nineteenth century, The Mary Baker Eddy Library. 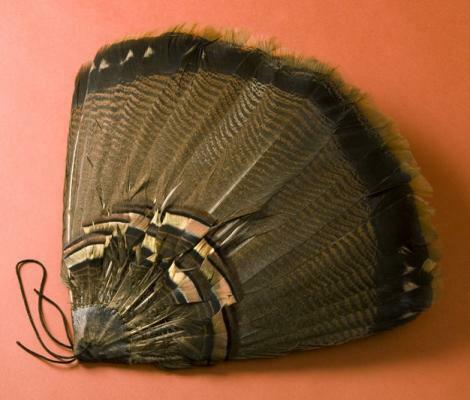 Turkey feather fan, mid-nineteenth century, Charleston Museum. 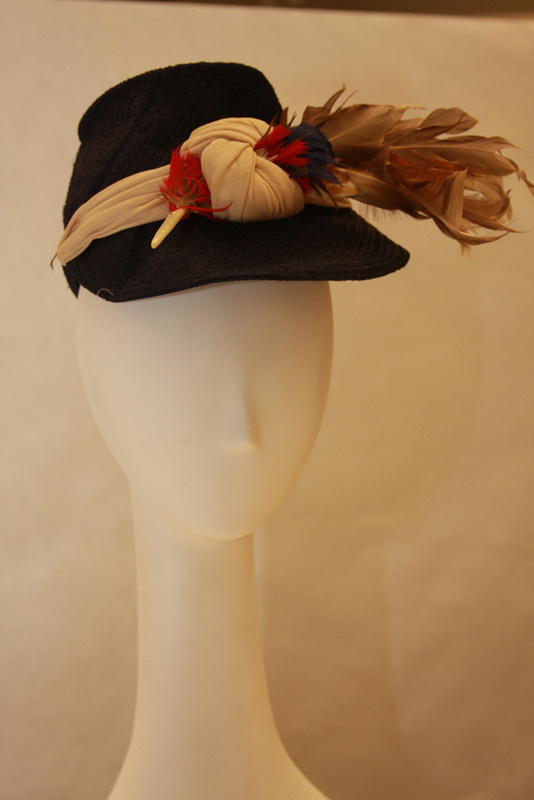 Turkey feathers have also been used as decorations on hats. Woman’s hat, ca. 1942-1945, canvas with jersey and turkey feather trim, Kansas City Museum. Advances in textile production have introduced new ways of using turkey feathers. Scientists have experimented with excess feathers from slaughterhouses to remove the stiff quill from the feather and separate the fibers that make up the feather; yarns are spun from the turkey feather fibers and nylon. The fabric woven from these yarns is being tested for insular properties for use in jackets. 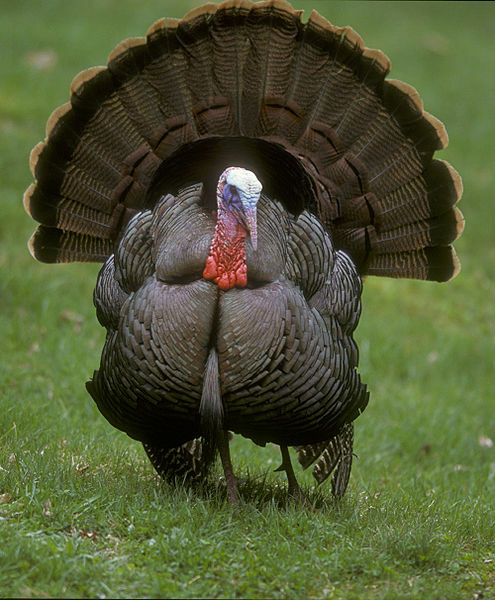 Of course, in a nod to the extreme, sometimes turkey feathers are used to construct entire garments. 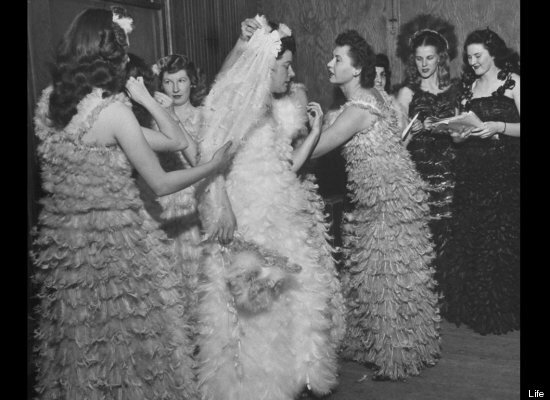 In November of 1947, Barbara Ehrhart crafted her wedding gown, as well as the dresses for her bridesmaids, entirely out of turkey feathers, in line with the Thanksgiving theme of her nuptials. Barbara Ehrhart and her bridesmaids. 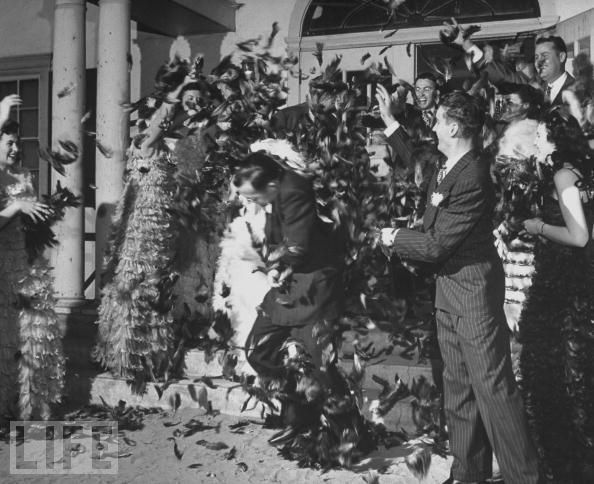 The happy couple was not pelted with rice when leaving the church, but showered with turkey feathers. Of course. In Ramona, California, once known as the “Turkey Capital of the World,” turkey feather fashion was at a premium! The city’s famous “Turkey Days” enjoyed their heyday from 1933 to 1941. 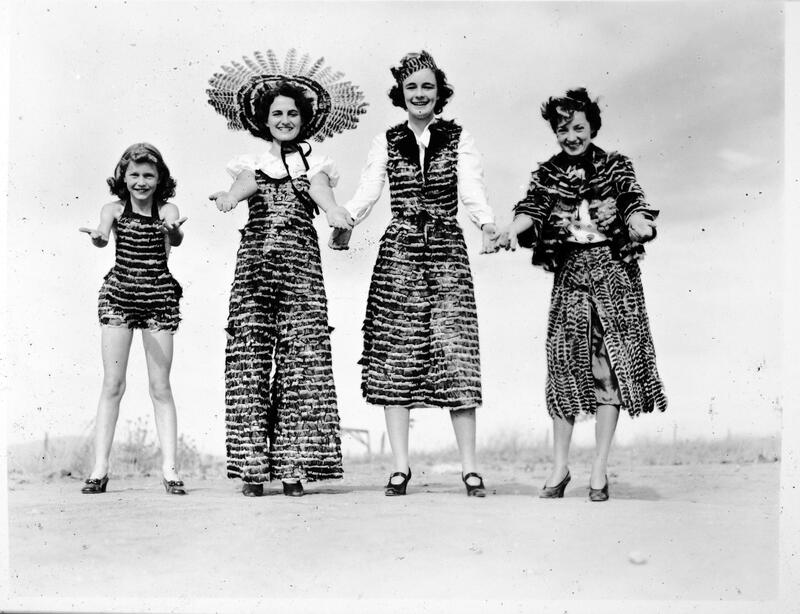 Publicity photo for the Ramona Turkey Day; majorettes and people dressed in clothes made of turkey feathers. No date. Museum of Man, San Diego. 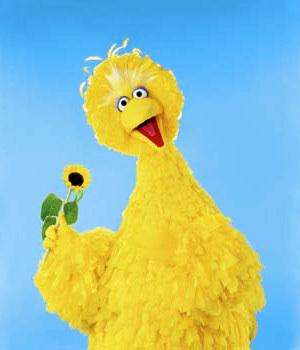 From High Street to Sesame Street, turkey feathers have long been used in fashion. Chanel’s current offerings highlight just how what’s old is new again. For our American readers, have a happy Thanksgiving. We’ll be back in two weeks to feature another fabulous Fashionista! Brownfield, Ann. “Historic Hats of Kansas City.” Kansas City Museum website. http://www.kansascitymuseum.org/CURATOR/curator_brownfield2.html (accessed November 13, 2012). Charleston Museum website. “Threads of War: Clothing and Textiles of the Civil War.” http://www.charlestonmuseum.org/threads-of-war (accessed November 13, 2012). Gorman, Jessica. “Materials Take Wing: What to do with 4 billion pounds of feathers?” From Science News, Volume 161, No. 8, February 23, 2002, p. 120. http://www.phschool.com/science/science_news/articles/materials_take_wing.html (accessed November 13, 2012). Himchak, Elizabeth Marie. “Ramona’s Turkey Days had all the Trimmins.” U-T San Diego. November 20, 2005. http://www.utsandiego.com/uniontrib/20051120/news_lz1mi20ramona.html#turkeyday (accessed November 15, 2012). Mary Baker Eddy Library website. 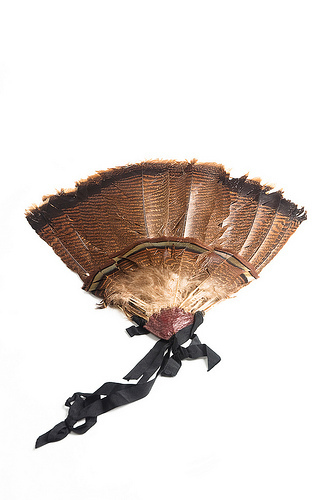 “Turkey Feather Fan.” http://www.marybakereddylibrary.org/collections/research/objects/item/turkey-feather-fan (accessed November 13, 2012). This entry was posted in Fashionista Friday and tagged 19th Century Fashion, Chanel, fans, feathers, Hats, Karl Lagerfeld, wedding dresses. Bookmark the permalink.